St Anthony's triathlon has a long history. This year was the 28th annual version but recent history has highlighted issues with the swim. In 2007, an athlete died during the swim. 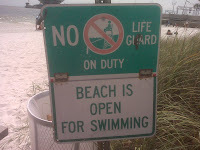 In 2009, the swim was cancelled for all AG athletes since the water conditions were so harsh. 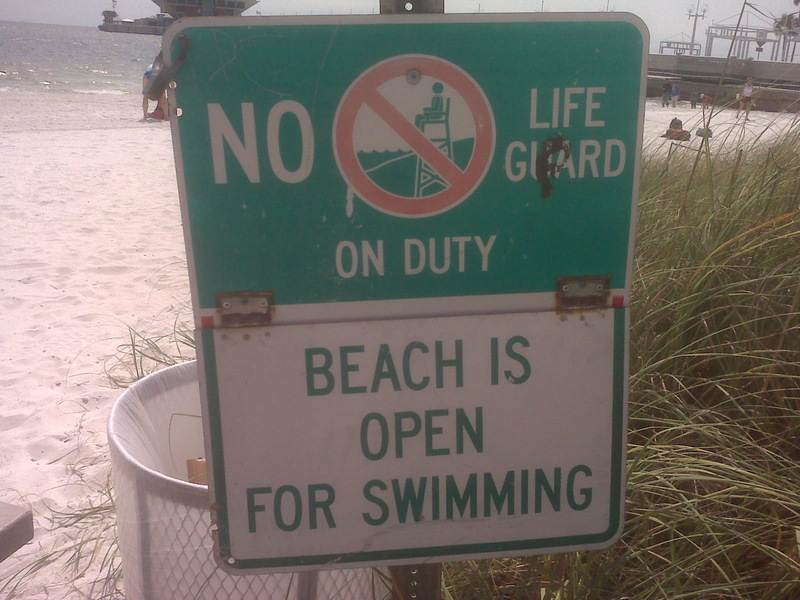 In 2010, the conditions got progressively worse to the point where they adjusted the swim distance midway through the waves with the later waves going a shorter distance than the earlier waves. The story of this year, I thought, was going to be the water temperature. Reports were that the water temperature was 80-81 and the use of wetsuits was unlikely. I am not a confident swimmer without a wetsuit, was hopeful that some miracle would happen, and packed both a full and a sleeveless one just in case. Friday morning I had planned an open water swim and I decided to do it without a wetsuit just to see how it would be. I realized that I haven't swam in real open water in a long time due to injuries but most of my open water was in salt water so that wasn't an issue. The water was a choppy and on the warm side (I estimated 80 since it felt a little cooler than my pool which is set to 82) but the wind was kicking up. I did fine but some of the other folks swimming were commenting about how rough it was. After my swim I felt that no wetsuit could be an option even though both times I've raced without a wetsuit can be described as epic failures. The rest of the day was dealing with administration stuff. I had to check in. I had to get my bike from the transport guys. I had to check out the expo. I only bought some necessities (2 gels and CO2 cartridges) but did buy the 110% compression/ice sleeves for my calf. I thought the idea cool (pun not intended). They were expensive but my wife commented that must be happy since I had everything already else already. 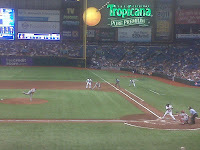 We ended Friday at Tropicana Field. It was an ugly game (Angels 8 with 17 hits, Rays 5). 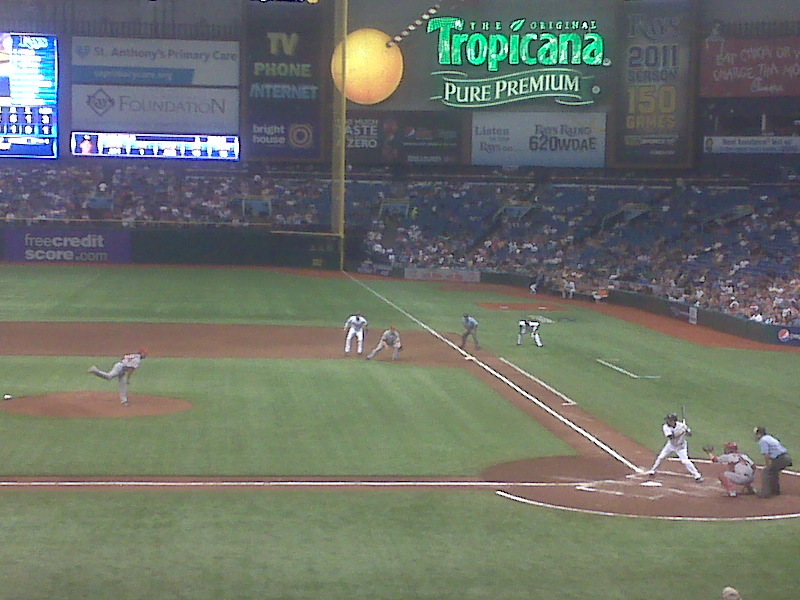 It is always fun to watch how other teams entertain the crowds and baseball, after all, is still baseball. Somehow baseball mellows me out. I didn't know I would need that though but it was good that I did get a dose of mellow. I used to love going to watch this race, bummed I never tried in all the years living there.